VVS Laxman was among those who put up a tweet for the Sri Lankan cricketer. 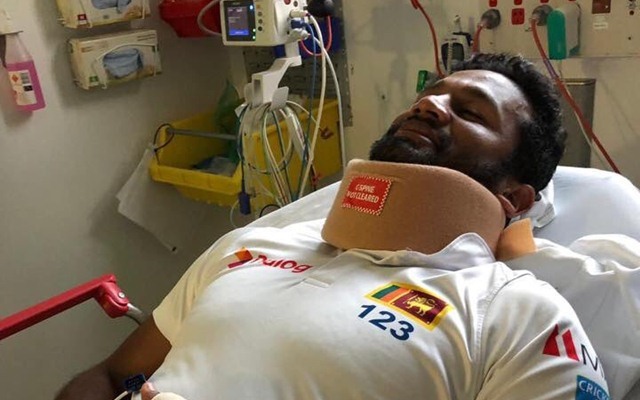 Things looked quite nasty after the fierce blow hit Dimuth Karunaratne on his neck in the Canberra Test. A short ball from Pat Cummins injured him so severely that he had to be stretchered off the field. As he tried to evade the bouncer, he turned back as he ducked. But, the ball didn’t rise as high and ended up hitting him. Karunaratne immediately collapsed and lost the grip over his bat. He was soon taken to a local hospital where he was assessed. The doctors checked for a concussion and cleared him to play the game on Sunday. He returned to the field and seemed to be fine. He batted in the match and is currently unbeaten on 8 in the second innings of the match. After this incident, Dimuth Karunaratne was flooded with wishes for his speedy recovery. VVS Laxman was among those who put up a tweet for the Sri Lankan cricketer and wished him a speedy recovery. “Happy to know that Dimuth Karunaratne is fine. Wish him a super speedy recovery #AUSvSL,” wrote the former cricketer. The left-hander replied to VVS Laxman’s tweet and said that he is fine now. However, he informed that he still feels a little bit of pain on his neck. But, he also cleared it that there wasn’t anything serious about the injury. He concluded by thanking Laxman for the wishes. “I’m good sir still have bit pain on my neck but nothing series (serious)….thanx for lovely wishes,” wrote Dimuth Karunaratne. Karunaratne has still got a massive task ahead of him. Sri Lanka needs 499 runs to win the second Test. With two days of play left, a draw is out of the equation. Hence, the southpaw would want to contribute big in helping his team save the match. Get the latest Cricket News and updates from Australia vs Sri Lanka series, Match Predictions, Fantasy Cricket Tips and lots more on CricTracker.com.